Take it from someone who has contracted a water-born infection before. Water purification is something you never want to skimp on. After dealing with Giardia from ingesting improperly “purified” water, I always take water purification seriously. There are several methods of purifying water. Here are four of the safest ways (when used properly). There are several types of water filters including pump, gravity, and straws. My preferred method has been gravity filters because of the ease of setting up the filter. Most gravity filters require gathering water in a dromedary, attaching the filter tubing and let gravity take it from there. The unclean water flows through the tubing into the filter. Most gravity filters include several layers of filtration to catch micro-organisms that cause infections in human digestive systems. A lot of filters will also contain a chemical such as activated carbon to reduce bitter tastes of tannins released from decaying leaves in a water source. Filters are a favorite of many outdoors people because they have the least negative effect on the taste of water, and they can be lightweight and easily packable. They’re also budget friendly, because they are multi-use and replacing parts is easy and cost-effective. To lengthen the life of your filter, gather water from clear water sources so that sand and debris does not clog the filter. Filters do not protect against viruses, so they are not a typical preference of people traveling to regions with higher rates of virus contamination. Cryptosporidium, but does purify most other protozoa. Boiling is effective when used properly. It’s not a common purification method anymore, except as a backup method or in specialty trip situations. A rolling boil must be reached for a minimum of one whole minute, or three minutes for higher elevation (when in doubt, go longer). This is time and fuel consuming. In addition to the time to reach a full boil, you then have to wait for the water to cool to a drinkable temperature. This purification method can be used for murky water, and then strained through a clean bandannas or other fabrics to filter out debris and sand. UV purification is a relatively new method and is not a common practice. It works by killing bacteria and viruses. UV light purification is usually in the form of a “pen” that is run on batteries. The light end goes directly into the water bottle or dromedary and either stirred or shaken. It is rarely used by itself, because it does not filter out any chemicals or debris in water. UV light purifiers are also expensive, and many people do not trust using anything that requires batteries in the back country. It is important to bring a backup purification method if this is your primary. When planning a trip into the back country, it is important to plan water sources along your hike. Take note of any trail guides that warn of unreliable water sources, as they can disappear in dry seasons. Whatever your preferred method of water purification is, always take a backup and follow instructions carefully. I was lucky that when I contracted the parasite, I recognized the symptoms early and was able to seek treatment early on. Some water-born pathogens can cause life-long complications, dehydration, and even death if left untreated. Fewer crowds and bare trees make winter hikes unbeatable for solitude and sweeping views. Be prepared to get the most out of winter adventures with these 6 tips. Before any hike you should check the weather, but this is even more important when winter hiking. You’ll want to check not only the temperature, but the predicted precipitation, wind and daylight hours so you can plan accordingly. Don’t forget that high elevation and bald peaks can make trail temps much colder than in town. Be prepared for all conditions. You may work up a sweat going up a steep incline and times but be cold walking a flat section or taking a moment to enjoy the view. Be prepared for unexpected changes in the weather by bringing layers that offer insulation and wind/water protection. Hiking in the winter can be unpredictable at times. Trails and conditions may not be what you are used to during the warmer months. Make sure that you have the necessary emergency equipment (see our blog post on Outdoor Safety Basics). It is always a good idea to throw a basic first aid kit in your bag and let someone know your planned route and return time. Because of the limited sunlight during the winter months, you might want to start earlier than usual on your adventure. Plan a turn-around time and stick to it so you can get out of the elements before the sun goes down and the temperature drops. With winter hiking, it’s critical to have the appropriate gear when heading out. Avoid cotton, it loses its warmth when wet and takes a long time to dry. Instead opt for synthetic, merino, or bamboo apparel. A few gear essentials are waterproof or insulated boots, baselayer, something to keep your head warm (hat, balaclava, etc), an insulated jacket, and a weatherproof shell. It is always good to have a change of clothes in your bag or waiting for you in your car! After braving the harsh conditions of winter, treat yourself to a nice warm meal and a hot cup of cocoa or tea. It’s always good to have a thermos of something hot waiting for you at your car or in your pack. Tubing the French Broad River is a quintessential Asheville experience, one which combines languid, fluvial enjoyment with artistic urban charm. You will float through forests, breeze past breweries, and find ample opportunity to shore up for local brews, bonfires, and food trucks. It’s no wonder that tubing has become a time-honored tradition here in Beer City. Read on for tips and tricks for cruising the French Broad in style. Get ready for a pleasant and peaceful day on the water. There are no rapids within this section of the river, only ripples, so allow yourself to relax and allow the current to gently carry you away. In fact, it’s quite possible to float the whole river without getting wet, although you’ll probably choose to swim or get blasted by the water cannon at the Asheville Outdoor Center. Be prepared for a highly social excursion. While there are plenty of places to find solitude on the French Broad River, this section is not one of them. On any given summer day you can expect whole legions of floaters, but as long as you know what you’re in for, this can make for a festive and convivial atmosphere. Aside from a raft, water shoes, and the recommended PFD, the seasoned floater will bring along a well-stocked cooler filled with snacks, ice water, and beverages. Most outfitters rent cooler floats, although they strictly prohibit glass containers. A tube paddle is optional but can help you keep up speed during particularly slow sections. Remember to bring a change of clothes, your ID, and plenty of sunscreens. The French Broad from above. As you plan your excursion, take into consideration how many miles you’d like to cover, time in the sun, and how eager you are to drink your take-out beer. Float times will always depend on water levels. 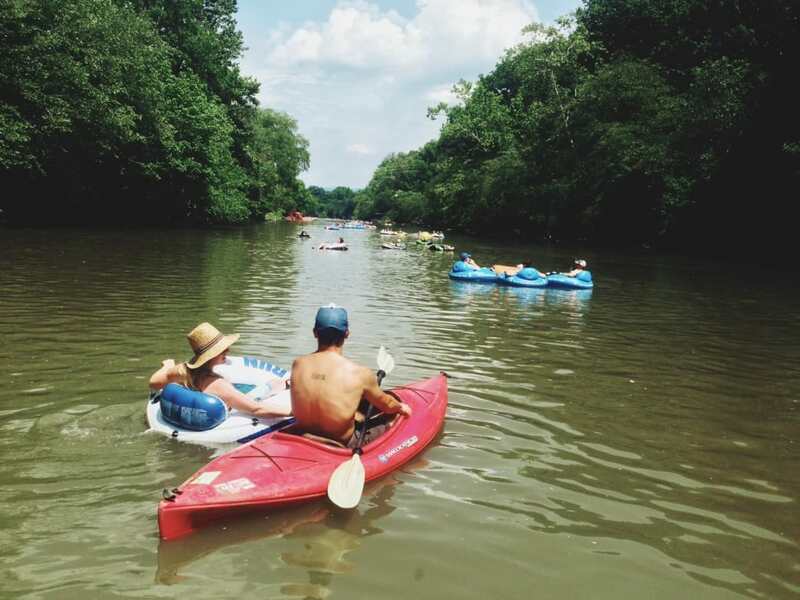 For an extended day on the river, begin at Hominy Creek River Park in West Asheville, just north of the Biltmore Estate. 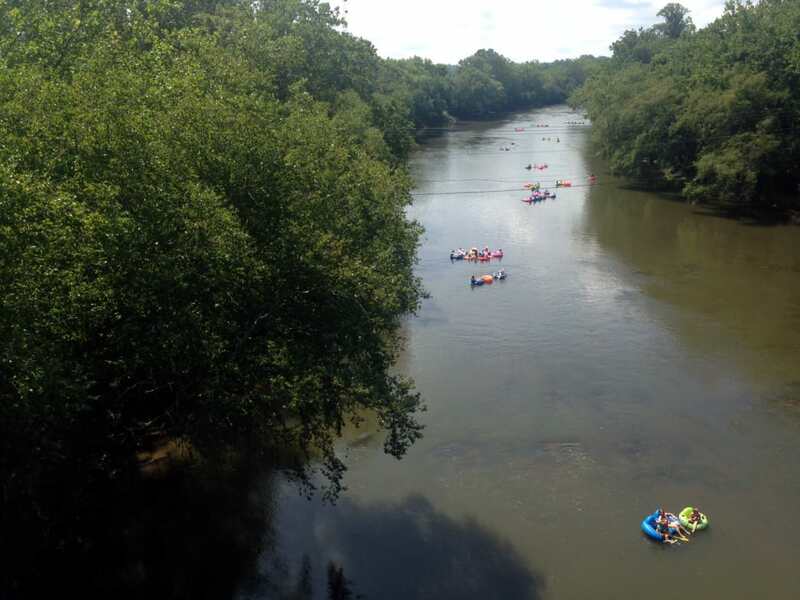 A second option, Carrier Park, is located approximately 1.5 miles downriver, about an hour and fifteen-minute float from Hominy Creek. For a shorter day, put in at Jean Webb River Park, two miles (about a forty-five-minute float) from Carrier. All three parks offer stacked concrete steps for easy entry. In addition, a number of informal pull-offs and sandy shoals offer even more opportunity to get in the water. Always be minded of private property. Many riverside businesses offer and encourage river access, including Asheville Outdoor Center, Asheville Adventure Rentals, and 12 Bones BBQ. A summer evening at The Wedge Brewery. While nothing beats a day on the river, some Asheville locals believe that the real fun begins at the take-out. That’s because riverside bars and restaurants offer a seamless transition between cold river and cold beer, no driving necessary. Your first option for dining is 12 Bones Smokehouse, which offers slow-cooked, scratch-made BBQ cooked in the traditional Carolina style. Their mouthwatering ribs, brisket, pulled pork, and sides (tangy pickled okra, jalapeño cheese grits) are famous throughout the Southeast; in fact, President Obama names 12 Bones as his all-time favorite BBQ joint, and claims it’s the number one reason he purchased a home outside of Asheville! Unfortunately for everyone, their Riverside location is only opened during the weekdays. That’s right, the store owner claims their popularity would utterly overwhelm them on weekends, to the point where the cooks would not be able to keep up with demand! If you’re floating by Monday through Friday, make sure and stop for some of this legendary Southern cuisine. If you’re a weekend warrior, float on by. Thankfully, The Wedge Brewery is just downriver. This is the most popular take-out for those who put in at Hominy Creek or Carrier Park. Famous for their Iron Rail IPA, The Wedge is a unique brewery that features outdoor seating in an eclectic and inviting ambiance. 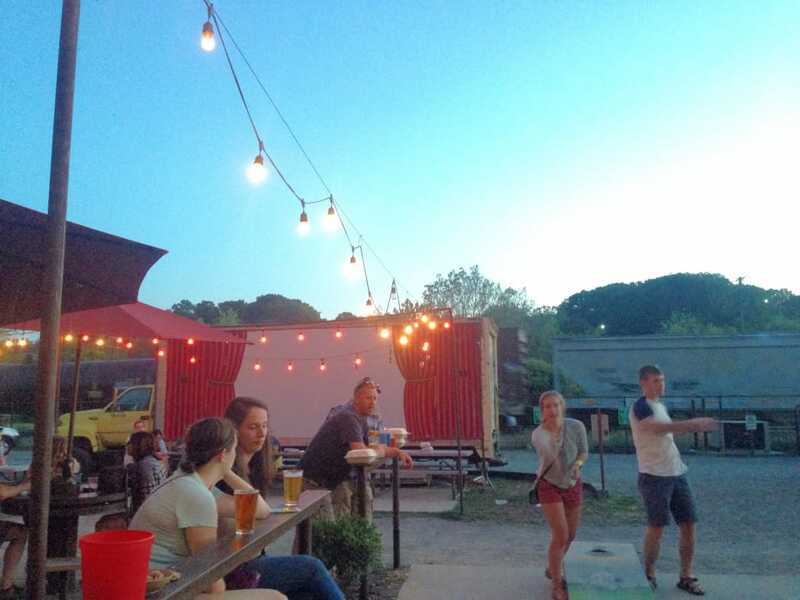 Split a pitcher of Apricot Pale Ale and a bucket of peanuts, or grab a bite from one of the on-site food trucks, such as El Kimchi or Melt Your Heart Grilled Cheese. Your final stop on “The French Broad pub crawl” is the Bywater Bar, a hot-spot for adventure enthusiasts offering a full cocktail menu, outdoor grill, and 18 beers on tap. Between the live music, lawn games, and locals milling between bonfires, you may feel as if you’ve stumbled upon a summer camp for grown-ups. Just remember that someone still has to drive the shuttle back to the put-in, so imbibe accordingly. River cruisers and fans of the River Arts District now have even more look forward to: the much-anticipated opening of both the Smoky Park Supper Club and New Belgium Brewery. Both establishments will offer yet another tempting reason to eddy out for beer, BBQ, and live music. Slow current makes for a peaceful float. 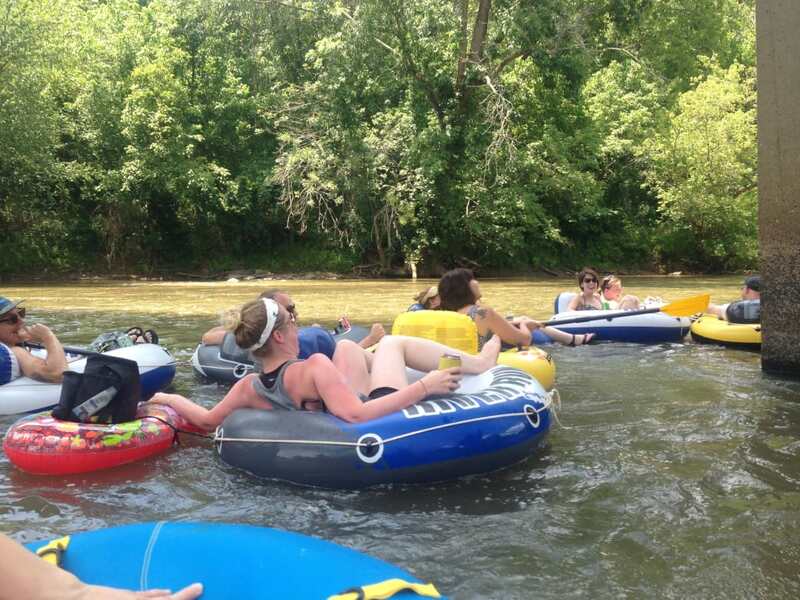 For an affordable price, Asheville Outdoor Center and Zen Tubing offer rentals and shuttle services for a variety of river sections. Asheville Adventure Rentals offers shuttles, gear, and beta for all things paddle sports. Here at Frugal Backpacker, you can find kayaks, tubes, and air pumps, and we will gladly fill up any tube you bring in the door. By all means, bring along your pup, but keep her safe and happy in the bird Dog K9 Personal Floatation Device, created by Astral Designs, a local Asheville PFD, and footwear company. Has tubing wet your appetite for the river life? There are some fantastic opportunities for adventure along the 140 miles of the French Broad River. Check out The French Broad Paddle Trail for a multi-day river trip, or bounce down the class III rapids of Section 9 by raft or kayak. This ancient river is one of Asheville’s greatest assets—go forth and explore!